We’d love your help. Let us know what’s wrong with this preview of The Bride Lottery by Kristin Holt. EVELYN IS IN A PICKLE. In less than five months, Evelyn Brandt will be an unwed mother. Her parents discover her secret and send her away on the next west-bound train. They insist she deliver the child on the other side of the continent where the disgrace won’t harm her father’s business empire and the family’s social standing. She’ll be allowed to return home after the child is adopted by decent people and her corset fits properly once more. SAM'S IN CHARGE OF THE BRIDE LOTTERY, AND THE COMPETITION'S FIERCE. 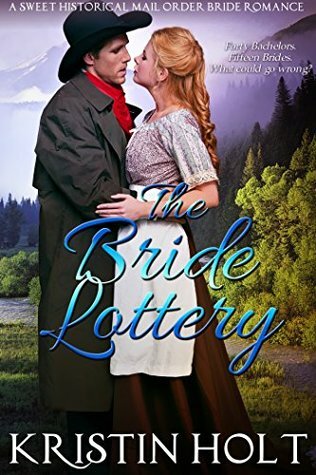 It’s too bad the mail order bride agency failed to round up even half their order, ‘cause every man on the mountain wants a bride—except Sam Kochler—so he’s saddled with enforcing the rules. He received information about each lady the agency sent, so when Evelyn steps off the train, he’s a tad curious and a mite too interested. To ask other readers questions about The Bride Lottery, please sign up. Daughters of New Money did not give birth and raise a child without benefit of marriage. Which is why Evelyn Brandt's father is sending her from their home in New York to his brother's home in California until the baby is born and adopted by an upstanding couple. And then she will return home, having been "abroad for educational refinement." That is her father's plan. But Evelyn has another plan... She can't stand to part with this baby. So when she meets up with some mail order brides on the tra Daughters of New Money did not give birth and raise a child without benefit of marriage. Which is why Evelyn Brandt's father is sending her from their home in New York to his brother's home in California until the baby is born and adopted by an upstanding couple. And then she will return home, having been "abroad for educational refinement." That is her father's plan. But Evelyn has another plan... She can't stand to part with this baby. So when she meets up with some mail order brides on the train she is convinced to change her plans and gets off the train with them. Of the men in Prosperity, Colorado only two of them don't want wives... the old cook and Sam Kochler. Sam had his heart broken by the beautiful high-society Octavia and has no plans to marry any time soon. I am always amazed at the dynamics of family and choices made. I had so many questions early in the book about family members and their choices which the author allowed me to dwell on and fuss over before providing the answers. I love the time period of this story, when women had a place not just in society, but in their homes and families. For one, it is a remarkable journey from a place of wealth and societal judgment to a place in the heart. For the other, a journey of acceptance. This book i I am always amazed at the dynamics of family and choices made. I had so many questions early in the book about family members and their choices which the author allowed me to dwell on and fuss over before providing the answers. I love the time period of this story, when women had a place not just in society, but in their homes and families. For one, it is a remarkable journey from a place of wealth and societal judgment to a place in the heart. For the other, a journey of acceptance. This book is filled with courage, determination, and a wonderful sense of belonging. Sweet story about potential brides invited to a mining camp 'town'. Sam nursing a bruised heart is running the show, keeping the roudy bunch inline refuses to participate. Evelyn, high society girl, shipped off in disgrace decided to get off the train, join the brides with a possible solution she may keep her babe. Sam in protection of Evelyn offers courtship but winds up offering more. However, they both have difficulties in their pasts & potential trouble shows up on the stage together. Small Sweet story about potential brides invited to a mining camp 'town'. I just love the Mail Order Bride stories as things were actually done this way and there were many marriages that were a total success. They make the way things go now look very bad. The idea of a Bride Lottery is a very unique perspective that was very entertaining to try to envision through this story. For whatever reasons that these brave women decided to go not only to the gold camps in Colorado but all over the west, the following generation would not be here if they were not so willing to seek their own fate and make their own version of history, even if this story may be fiction, the articles that the author used in her research provider the seed for her story. It was a very good read, hope to see more. 👏BRAVO!!! I enjoyed the story and the characters well. It is well written and the writing flows as it should. This is the story of a young lady who thought she found the one only to find herself pregnant and the father long gone. Her parents send her away to have the baby and give it up for adoption so she can come home and marry their choice of husband. On the train she makes a detour and find her future. This was such a good story, but when Octavia showed up, I had stop reading for a few days..and her parents..."double whammy". I loved her parents, couldn't stand them in the beginning but they truly redeemed themselves in the end. I also didn't anticipate "Pickle Pike's" turn around...that was awesome. Really well written, totally enjoyed. Kristin Holt is an awesome author!!! Prosperity's Mail Order Brides is an excellent read Can't wait to read the next book of this series. There is so much wit, humor and love in this novel. I'm sure you will enjoy this love story as much as I have. Please refer this novel to family and friends. A well-plotted story of a journey to true love which is never smooth, this book encompasses many of society's mores of the time. I really enjoyed reading it and staying with the twists and turns of fate in it. This is the first book I have read by Kristen Holt and I will not hesitate to read another! A great read. Enjoyed the description of the country and a time when it took a special solution to get brides to the men on the frontier. I can only imagine how the women felt about this new adventure. I love a good series that has such a strong beginning. Here is a spoiler, how many books can there be when there are 39 miners, 14 brides came in this book and 20 are supposed to arrive next book? I hope there are a lot of stories there. Several funny stories of adventure and struggles to win one of a number ladies looking for a husband and a family. This was a quick, interesting read. I enjoyed it. I really enjoyed this book. It was very well written and moved along at a good pace. The characters were all developed well. A very mild book, this takes one of the oldest stories, around the block one more time, with grace and dignity. Ms Holt creates a group of colorful men, and adds a smattering of women. The female lead (Evelyn) is relatively well-defined prior to their meeting, while small bits and pieces of the hero (Sam) are revealed for most of the book. Just how much she changed between the beginning and end are almost totally concealed, while the true wealth of his maturation is suddenly brought into question A very mild book, this takes one of the oldest stories, around the block one more time, with grace and dignity. Ms Holt creates a group of colorful men, and adds a smattering of women. The female lead (Evelyn) is relatively well-defined prior to their meeting, while small bits and pieces of the hero (Sam) are revealed for most of the book. Just how much she changed between the beginning and end are almost totally concealed, while the true wealth of his maturation is suddenly brought into question as the story reaches its peak. As the story ends, there is a rather complete and unexplained change of heart by Evelyn's father that could have been handled more believably - perhaps by giving her parents a couple scenes alone. However, the fact that they have (somehow) figured out where she is does speak volumes to the fact of their love for their child. As in many romances, there are supporting characters whose existence builds the story. In many stories, the females in this group are built into fairly well-fleshed figures. The fact that a majority of the women are as nebulous at the end as the beginning serves to emphasize how isolated Evelyn is. The men are slightly more defined, usually through using an interaction with Evelyn, which serves, again, to emphasize her aloneness. Fairly predictable, but cute story. Evelyn finds herself in trouble when her beloved leaves her expecting a baby. She is shipped out west only to come home when her condition is remedied. Sam is helping run a lottery for mail order brides. He wants nothing to do with marriage- he has been hurt too much to ever want to marry. Evelyn meets the brides to be on the train and decides to throw her fate in with theirs so she can marry and keep her baby. Of course the only man she is interested in is Sam Fairly predictable, but cute story. Evelyn finds herself in trouble when her beloved leaves her expecting a baby. She is shipped out west only to come home when her condition is remedied. Sam is helping run a lottery for mail order brides. He wants nothing to do with marriage- he has been hurt too much to ever want to marry. Evelyn meets the brides to be on the train and decides to throw her fate in with theirs so she can marry and keep her baby. Of course the only man she is interested in is Sam. Slowly Sam finds his heart thawing and his conviction to never marry wavers-- but what do he or Evelyn really need? I love a good Mail Order Bride (or Groom) Romance. This one was good if predictable and then it stalled into mundane a bit annoying. I really hate added in conflict when two people who don't really know each other and the backstory each bring is enough. There is a moment in the book where are I just groaned because we had to deal with the OW (Other Woman). Why? I would have instead like to have couple time and seen the leads actually fall in love. I really thought the book was written well and I enjoyed the story very much. Your characters so down to earth just what you thought of those days. Thanks for a good story. Predictable but I loved it. Yes, predictable as usual but different too so it kept my interest. I loved Sam's character and his gentleness. You will love this if you love reading about mail order brides. Kristin Holt, USA Today Bestselling Author writes Sweet Victorian Romance set in the American West. She writes frequent articles about the nineteenth century American west--every subject of possible interest to readers and amateur historians. She contributes monthly to Sweet Romance Reads, Sweet Americana Sweethearts, and Romancing the Genres.